Karl Longbottom has been invited from his home in the UK to far away places because of his kites. The fighting underwear- mens and womens, the angels, the mad hata, his new tye-dyed della portas, the giant stacks of yakko bees. 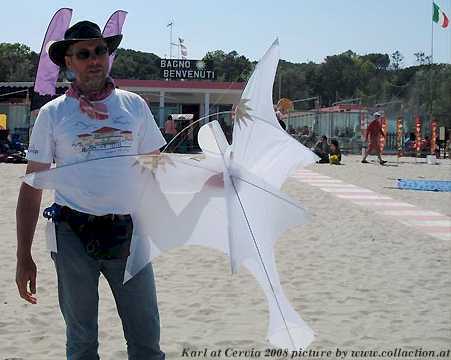 Karl is not only known for his kites, but also for his kite making workshops. A genuinely nice kitemaker. Simple as that. 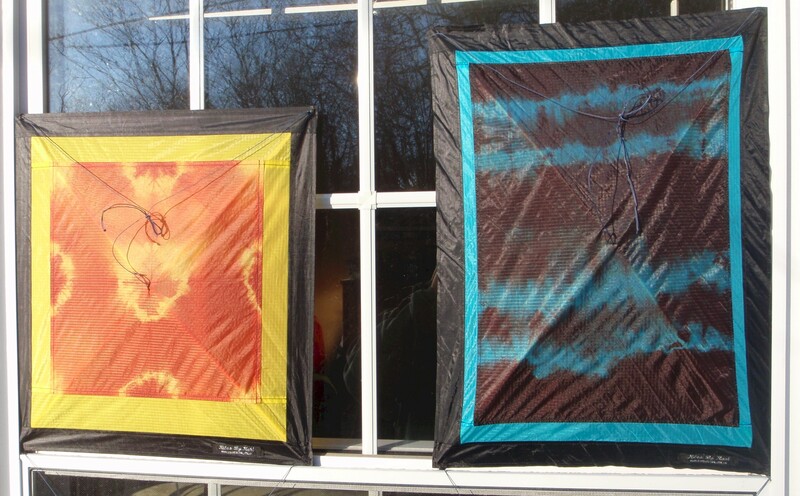 Karl's kites are amazing-both in design and in craft. When we first saw pictures of these kites we thought that they were flat kites. There was 2 in the first package we received from Karl. 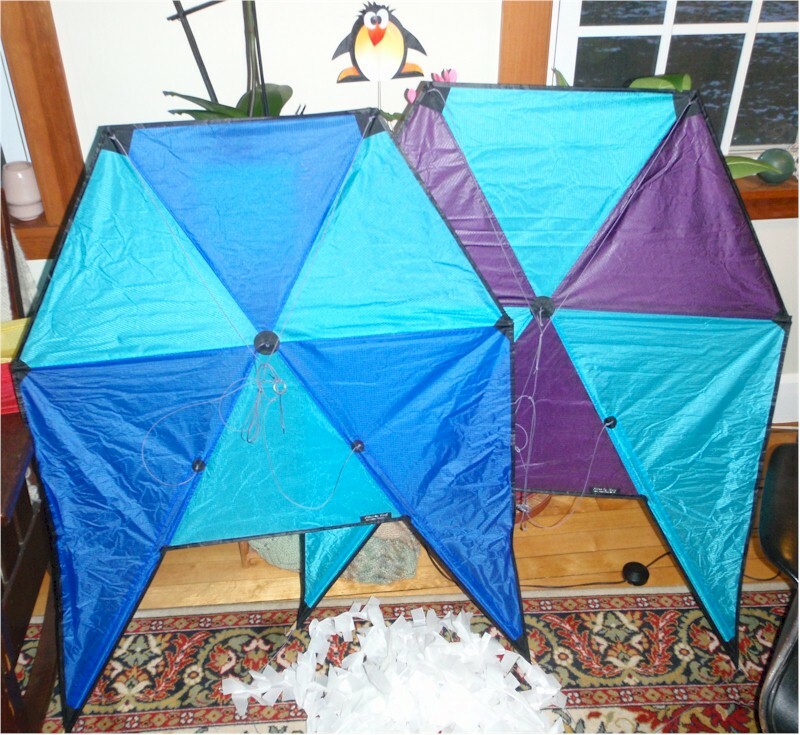 We immediately pulled them out and went to put one together and-WHOA-these are NOT flat kites in anyway!!!! 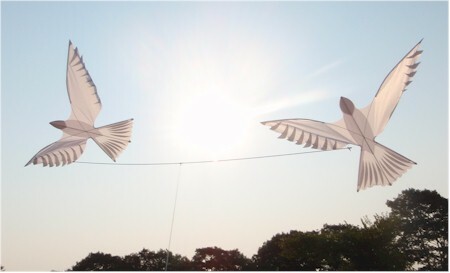 These kites are completely 3 dimensional and look amazing in person. There are 3 sizes of Angels that Karl makes. The Miniature is a "Christmas tree decoration that flies" was designed to be a holiday tree topper (or a plant sticker in our case) that flies as beautiful as it looks. 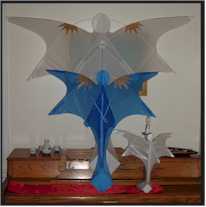 The Medium and the Large Angels are both good size kites that make a great impact. 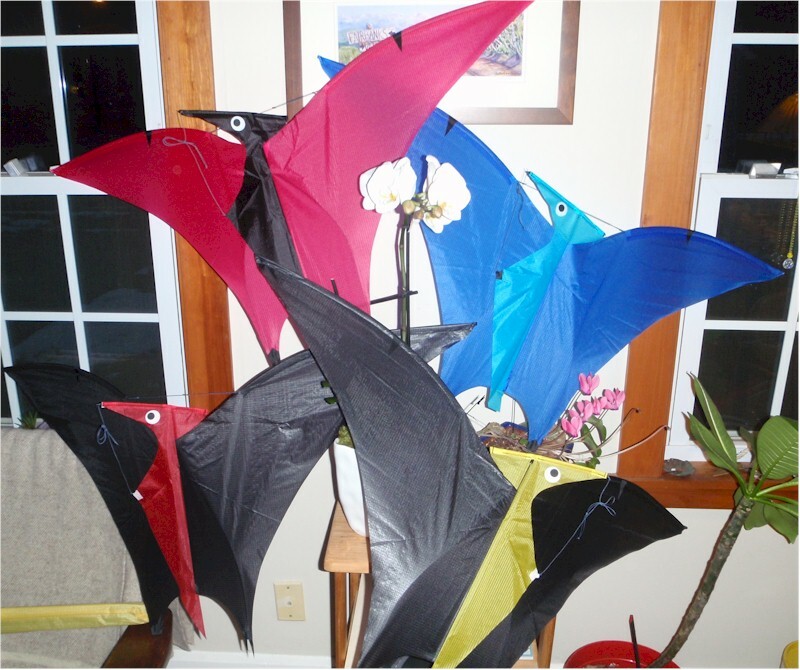 These kites are perfect for a memorial fly, outstanding for a night fly (the white ones), or even hanging in a room on display. $35 shipped to the U.S.
$95 68$ shipped to the U.S.
$180 130$ shipped to the U.S. The Doves fly as a pair depending on one another. With wings flapping they create a wonderful show. tie your flying line to the middle of the rod they will fly together. Bridle them so they fly stable, or tweak them to be a bit more active (our choice) for a constanly moving display. The Dove pair is 300$ shipped in the US. They are a great addition to your bag! A neat kite like no other. 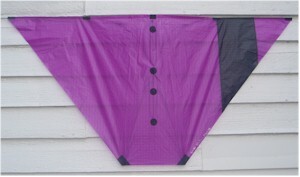 This kite has an elongated spine both above and below the main sail and trails off to a satin ribbon tail. It is designed with a dihedral (wings swept back) for stability- but also has sweptback fluttering wings of hot cut strips of material as well. A basic 2 leg bridle makes it simple to get up in the air. Neon yellow and aqua blue are left, the red one is gone. 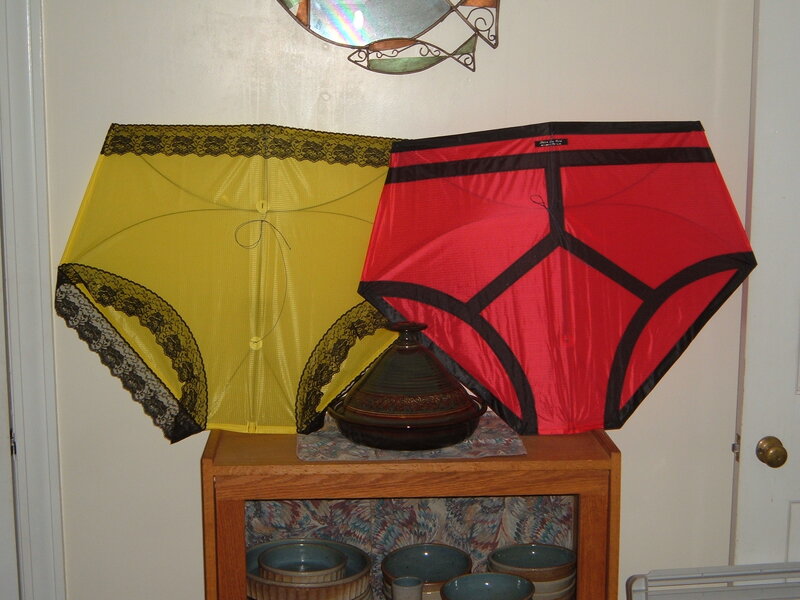 These are not your Granny's undies!!!! These are well designed fighter kites that are like no other. Great for the battle between husband and wife. 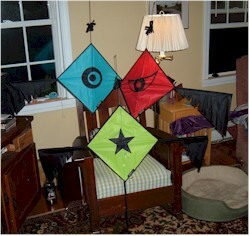 Add a simple tail and these kites should be stable enough for un-watched flying. Karl has made these with a simple 2 leg bridle and a bow line across the back of the kite (sort of like a Buka fighter kite). Pants come in different colors to match your outfits. Both style of these kites are $95.00 shipped to the U.S.
BEWARE: these little guys are crawling into kite bags of flyers everywhere!!! 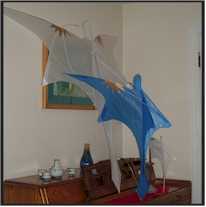 One of Karl's newest creations is a great flyer in those ultra light wind conditions, even indoors. Those days when you get to the park, but did not bring a SUL dual line or quad line kite, and there is barely enough wind to blow your hair around is when you find your little dinosaur-ish friend and give him some air time. good luck if you can get him to do a controlled flat spin in 15 mph wind! Pterodactyls are great all around and over you flyers. In the slightest wind you can have him doing flat spins, and up and over's with ease. Tuned by a tension line behind his head/across his shoulders you can adjust him for his trick-ability. More tension will have him flying more stable on his own (this works great if you fly a train of them), and less tension will make him be a better tricking kite. Because the bridle is attached to his nose and belly the keel/belly is used more as a rudder when flying him; as he flys away from you flick the line to one side and the head and keel will curve the Pterodactyl in that direction. Plus, who would not love a face like that! They have personality!!! We also have the Large Pterodactyl from Karl as well. These are twice the size of the above Pterodactyl, and are all icarex. These fly better in zero wind conditions than the standard sized ones. 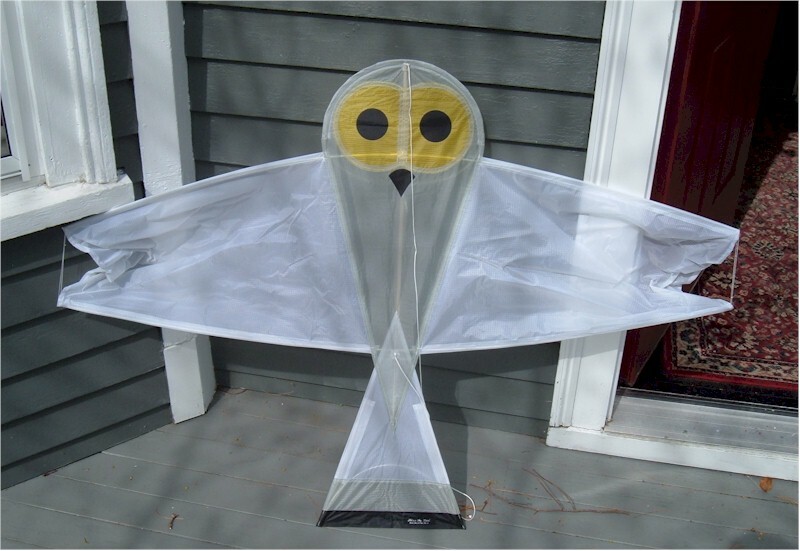 Karl's Owl kite is a fantastic lighter wind flyer. Think of all of those night flys where there was just not enough wind to get a kite in the air - well the Owl will pop right up and look VERY appropriate! 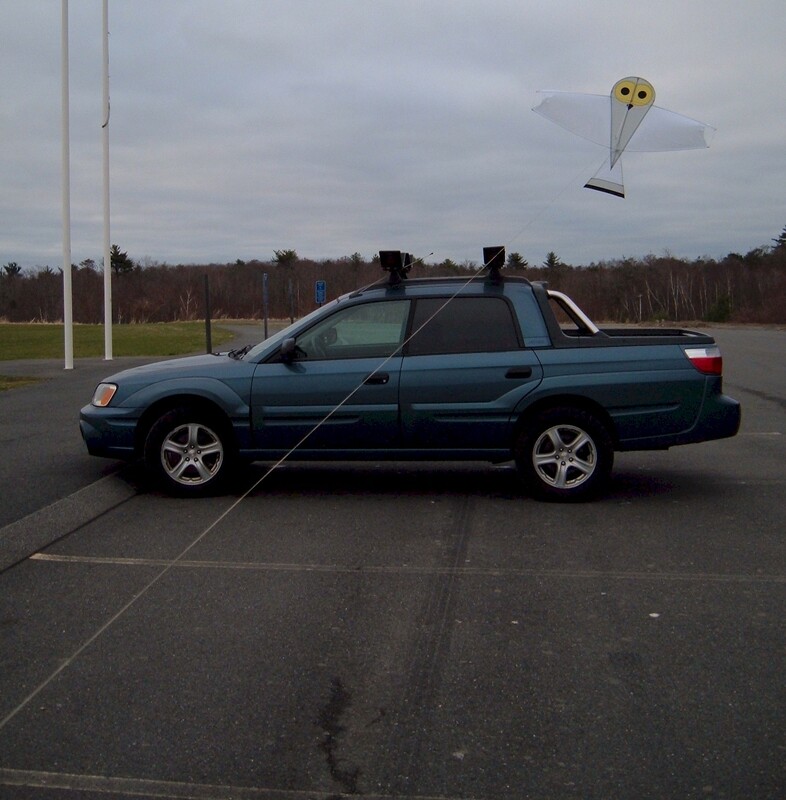 The Owl is a modified Yakko style kite. As you can see the wings have two rods in them: one in the upper edge and one in the lower edge of the wing. These rods are parallel when you assemble the kite, but then they bow backwards and towards each other in flight. Any gusts of wind spill off the wings very easily. 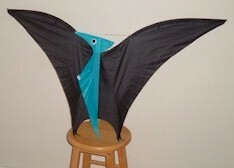 A good size kite as the wings are 52" wide and the kite is over 3 feet tall. This is a great addition to your bag, cleanly crafted by Karl. $90.00 shipped to the US. 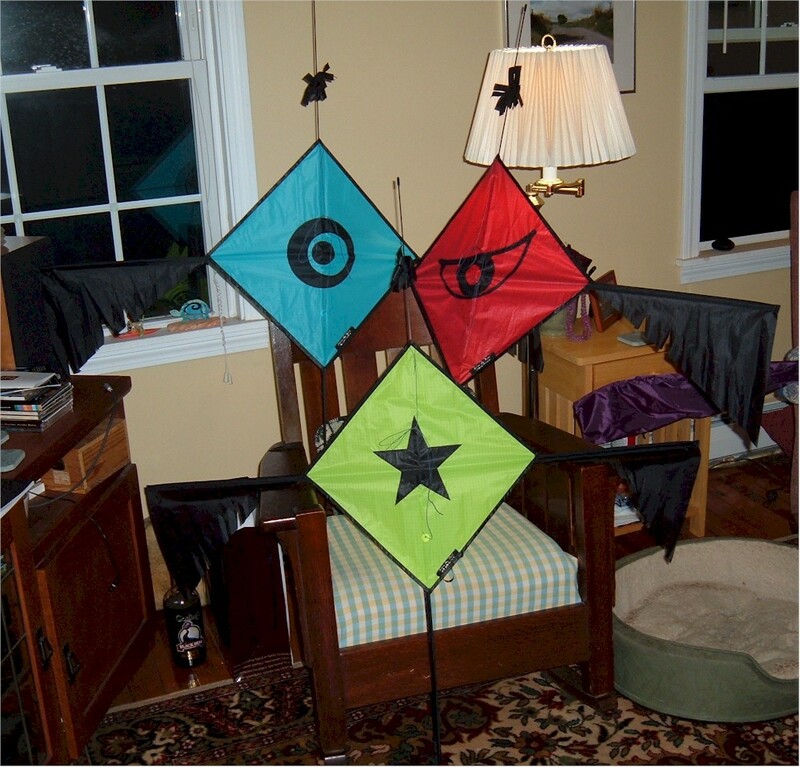 The newest xUL kite from Karl. 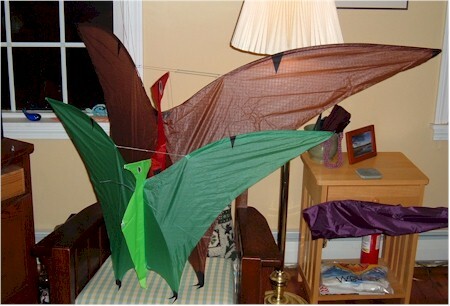 This kite obviously has the same basic design as the pterodactyl, but with some refinements. The spine is only 2/3rds the length of the kite, while the rods that are extended from the wings extend below the spine. That creates an area with some flex, so that when the kite is under tension a valley forms in the skin there helping toguide the kite on a straight track. 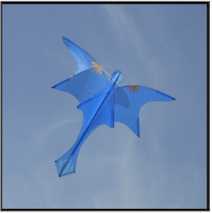 This is a nice floaty xUL kite, fly it in your back yard, inside your garage or airplane hanger, or at the beach on a calm day. Need to add one to your bag? The 6-81 is priced at 83$ shipped in the US. Karl has been making some new kites! These are smaller sized ~12-18" squares and rectangles that are painstakingly dyed. These kites are individual - as the dying process cannot be perfectly repeated - and are great flyers. They pack down to a nice ~1" x 23" long bag so you can bring them along anywhere you want to. A basic two stick wooden frame makes assembly very easy. Their matching fuzzy tail keeps them in check in unstable winds. 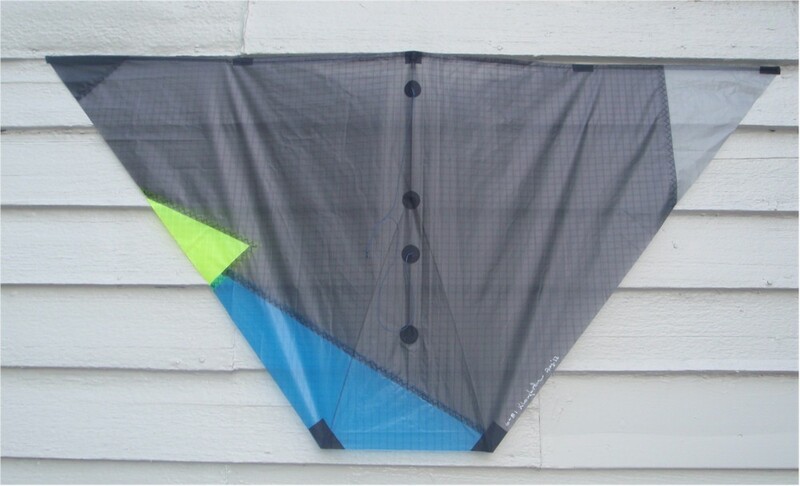 These kites are 67$ shipped to you in the US via Priority Mail. 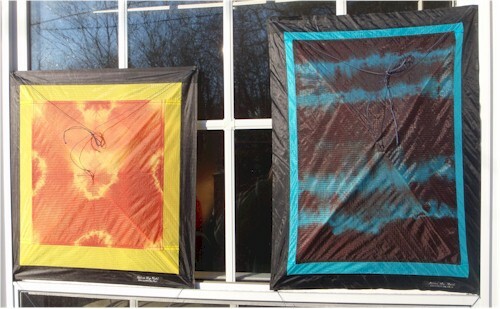 There are Hot colors (like the left kite) and Cool colored ones (like the right). We will check with you which kite you want with the verification of your order. 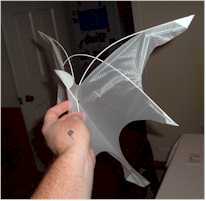 Karl has made up a big fighter kite that is based on the Brazilian Pipa Fighter kite. This is not a small zip-zip kite, this is a ~3' fighter than will fly phenomenally in most winds. Of course, Karl's engineering background has come into this kite with the skin tensioning method. Ths Pipa is 95$ shipped in the US. Click the picture to see some options. So, I love 3 stick bermuda styled kites. Karl makes his own version that he calls the Tangram. 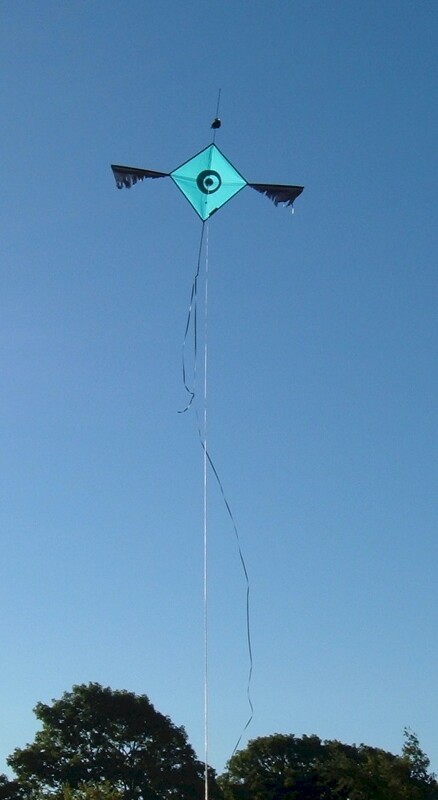 You can see the basic hexagonal shape of the Bermuda style kite, but it whas some extra bits. 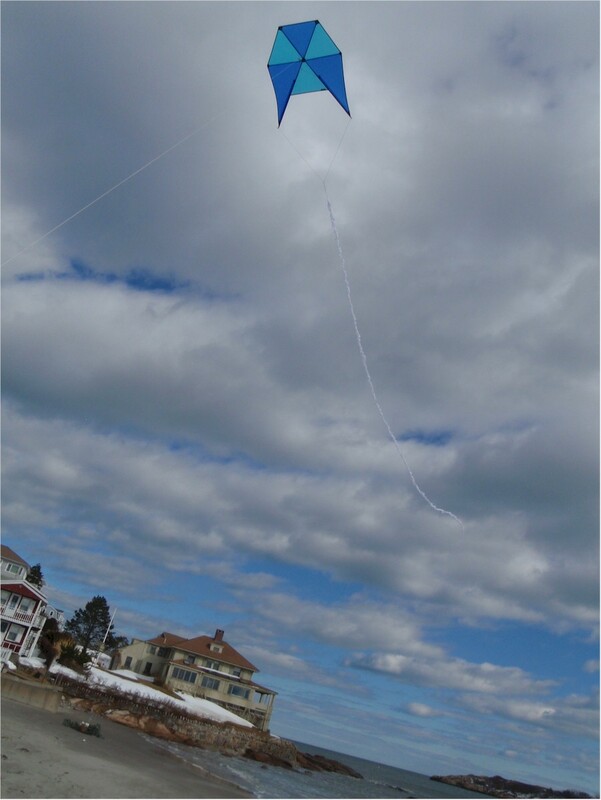 The extra elongated side sections help to stabilize the kite, as does the long fuzzy tail. 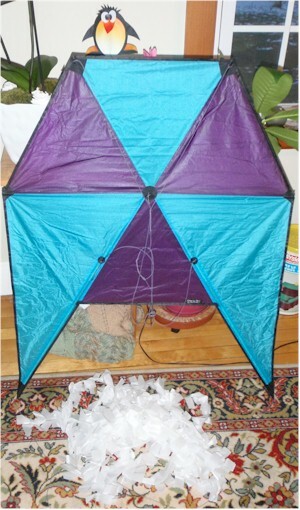 There is a special 5 leg bridle that helps to keep the kite stable as well. This kite is a great flyer in all sorts of winds, very easy to assemble and pop into the sky. The blue/blue one is gone, but the purple/blue one needs a home. Assembly and flight sheets for Karl Longbottom kites. Right mouse click and "save as" is the best option. These are two folders of instructions and photographs of Karl's Swan kite. 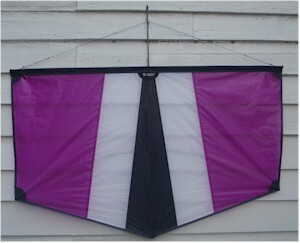 It is a popular kitemaking class kite that he provides.